The past few days have been quite busy, for me at least. There are times it is difficult to reconcile the reduced activity level from days past. Now I am an observer of life as it passes me by, or as happened today, in front of me. It had been a quiet day, quiet apart from the cacophony from the building sites and the ever present noise of vehicles scooting past. The peace and tranquility of the Crystal Castle seemed a million light years past. Ray had just brought a beautiful cup of French Earl Grey tea in for me. It has the most beautiful of aromas if you like the slightly perfumed teas. Suddenly there was an ear splitting noise from outside my window. It sounded like a cross between a cats howl, dogs growl and a thunderous rumbling from some devilish creature. I have never heard anything quite like it before. 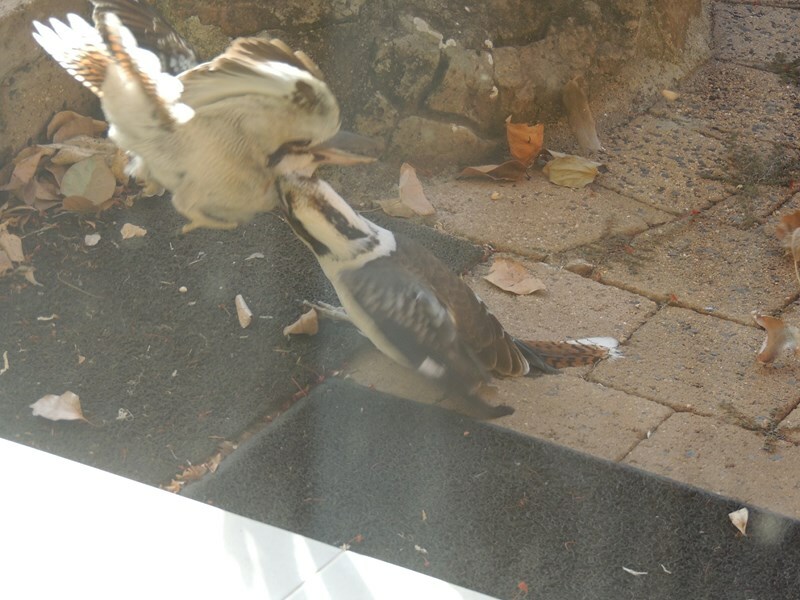 Curiosity drew us to the window to see what was making this deadly racket It had doubled in intensity so we knew two creatures were locked in a fight to the death. 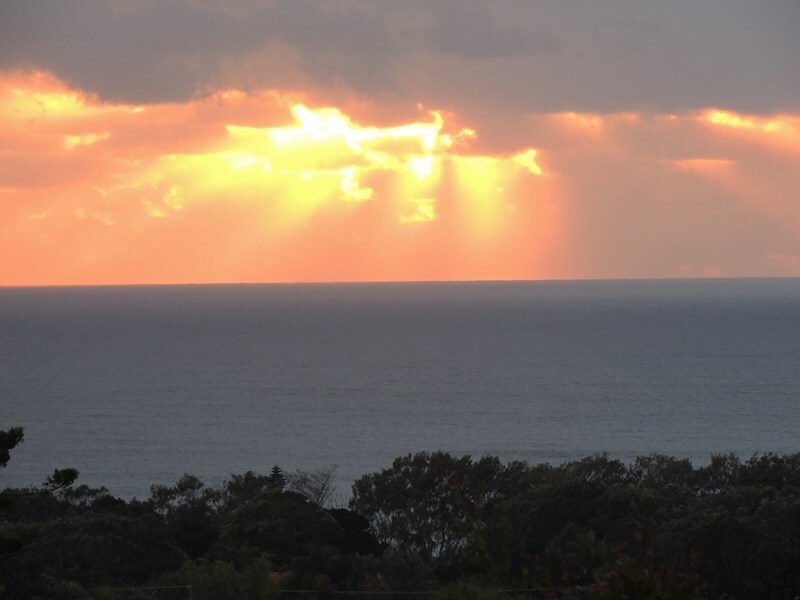 The sight that met our eyes was totally unexpected. All the photos of the fight were taken through the window, hence the diffused appearance. Here you can see the dominant bird has almost a death grip on his opponent. The Laughing Kookaburra is well known as a symbol of Australia’s bird life and is also known as the “Laughing Jackass”. I have seen then sitting atop aerials and tall posts, our balcony rail and flying around. They are territorial birds and the largest member of the Kingfisher family. They have a beak which can reach 4 inches (10 centimeters) long. It has a wicked looking hook on the top beak. They are known for attacking even Brown Snakes. As you can see, at the beginning of Spring, in a fight for territory they will fight each other. With a lunge the challenger tried to get away but there was no going until the duel was over! Flung back to the ground the noise became even louder. One beady eye was all we could see but it had death deep inside its black depths. As the challenger was pushed towards the front porch it seemed a matter of time until there was only one bird left standing. With the end possibly in sight I couldn’t stand by and watch it happen. (I know, its part of life in the wild). Being the brave soul I am, and also wielding the camera, I sent Ray outside to see what would happen. Usually, as soon as humans appear most birds will fly away. 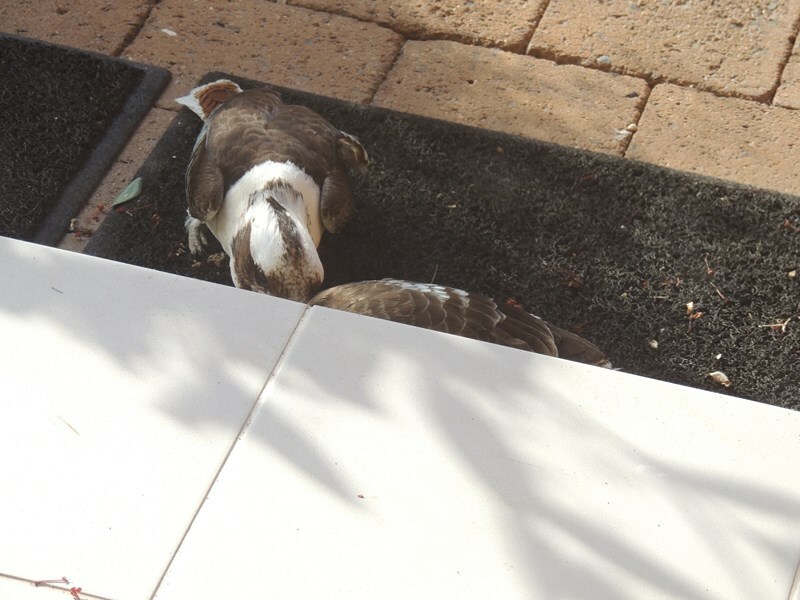 The Kookaburra doesn’t seem to have this fear of people. He knows he is the “King” in his arena. For the longest moment there was no reaction to a human presence. I was beginning to doubt that there was anything except one end, the death of the loser. The dominant bird must have eased his grip slightly which allowed, with a sudden flurry of feathers, the downed bird to take off. With a squawk of fury, the other bird flew after him. Through trees and round bushes they disappeared into the distance to continue to the struggle or until he had chased his competitor out of his territory. Once more secure in his territory he reappeared to sit, keeping a wary eye out for interlopers, on our balcony railing. 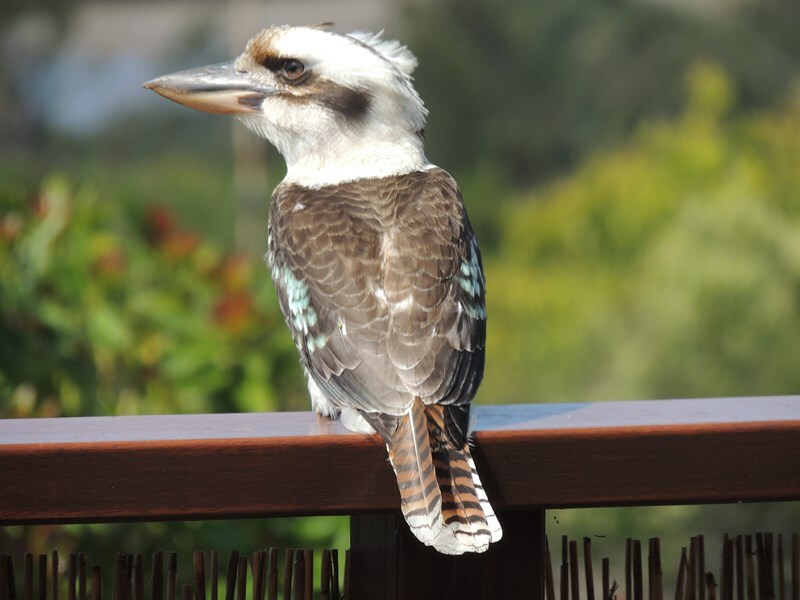 Once more he was the Laughing Kookaburra, “merry merry king of the bush”. 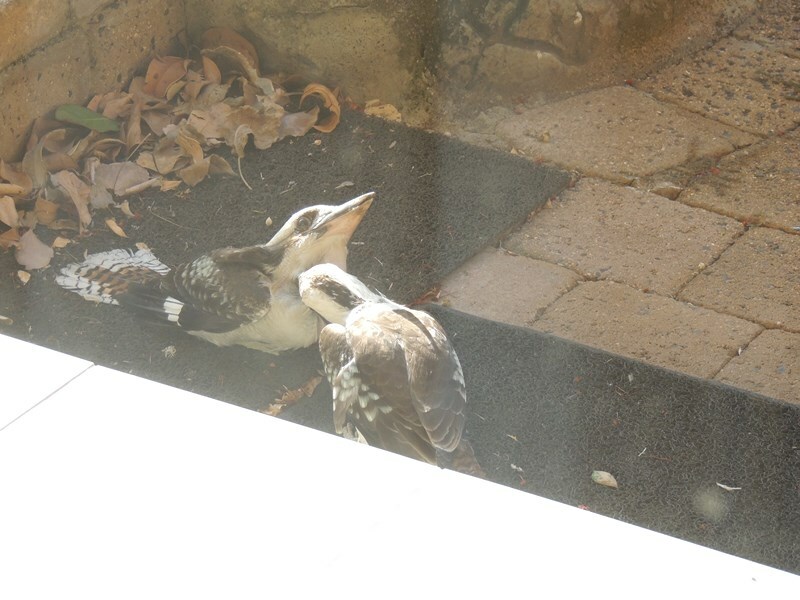 Laughing kookaburras are monogamous, territorial birds that nest in tree holes. Females lay one to five eggs, which are tended by a collective unit composed of parents and elder siblings. 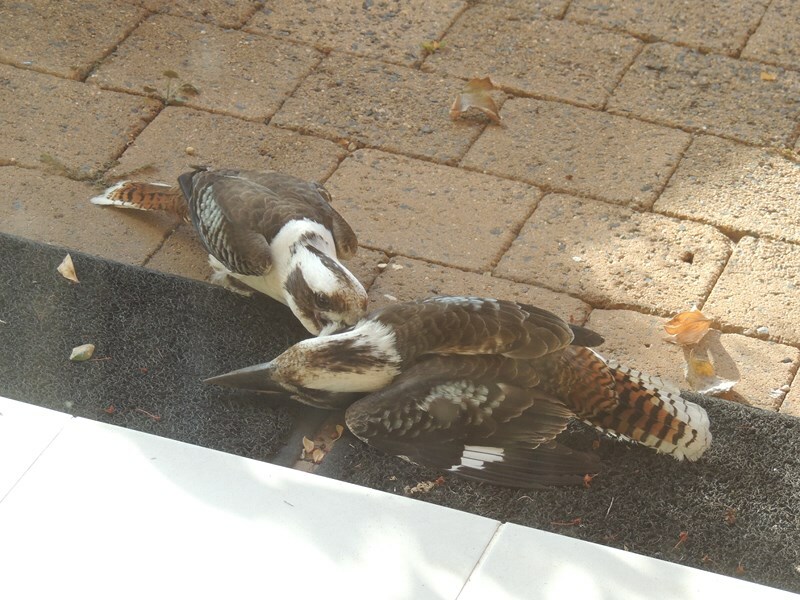 Fledgling kookaburras generally remain with their parents to help care for the subsequent clutch. Who can forget the Children’s nursery rhyme? I might add that this is thew first time I have seen the full lyrics. I guess you weren’t running a book on the outcome then Susan???? Sorry, it would be distressing, they really get stuck into each other. it’s even worse when they fly into a window, I’ve seen one take a huge chunk of glass out of a thick window once. Not pretty. Great pics by the way, it’s the subject not how good the picture is. people don’t mind a bit of light and blur if something epic is happening. 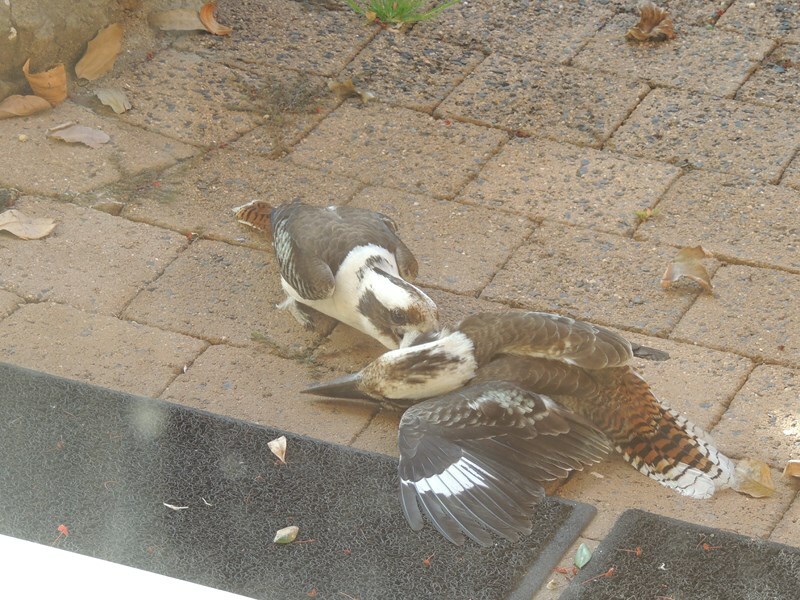 I know they are territorial but I’ve never seen it demonstrated…. Especially right under my nose, so to speak. And the noise! Ray filled me in on the background – after the rescue! I’m not sure how many would have seen it before which is why it made such an impression on me. Battling Birdies! Yeah Susan, great shots. it’s always more impressive when bigger birds are involved. Animals rarely fight to the death, it’s all about submission.